A new Hot Topic website is coming June 2012! Stay tuned. For now, here's the archive. 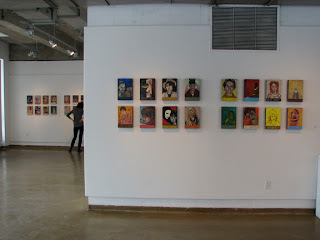 Between 2006 - 2008 Montreal-based artist Kirsten McCrea undertook the task of painting the portrait of every single person named in the Le Tigre song ‘Hot Topic’. 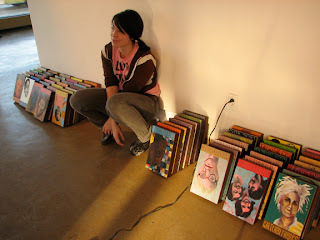 With the addition of the members of Le Tigre themselves, the total came to 60 paintings. The goal of the project was to engage in a form of activism that was not critical of dominant culture, but instead celebratory of alternative social movements. The series depicts an informal “who’s who” of feminist icons from the last century, and it is the artist’s hope that these paintings will play a small role in preserving the memory of these influential underground figures. 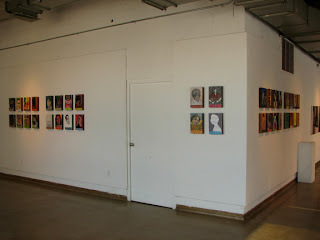 The paintings are exhibited along with a free ‘zine (see above) that includes a short biography of each person, so that the gallery can act as an environment of dialogue and education, rather than as merely a visual space. 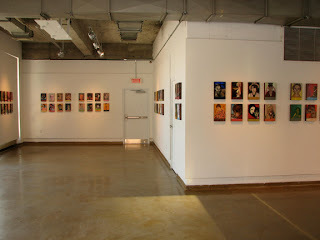 Hot Topic is shown in traditional galleries and in community spaces alike (in support of organizations such as the Sexual Assault Centre of McGill and V-Day Montreal). Scroll down to view the series. A short biography of each person can be found in the comments under their page. Click on the images to see them at high resolution. Below are some installation shots from the showing held from February 3-15, 2008 at the VAV Gallery at Concordia University in Montreal. i love these pieces. 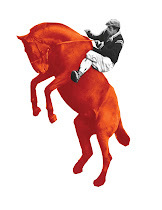 very creative, kind of andy warhol-esque from what i can see? i love it!